Trying to figure out how to build or buy a completely EMF-free optical mouse without any electronics in it, I came across these MRI (magnetic resonance imaging) fully optical controllers. When you put people in MRI machines, and you want to monitor their responses to commands or cues, you cannot put anything metal into the MRI machine. The magnetic fields are so strong any metal objects would become lethal projectiles. 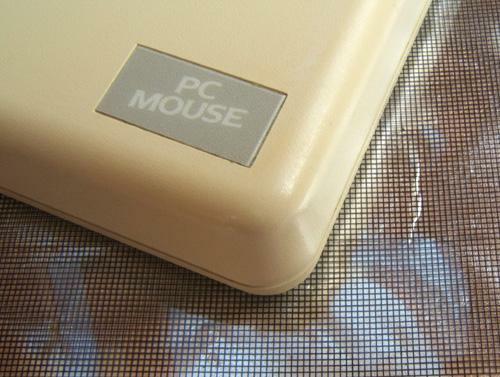 So we have companies that develop fully plastic and optical controllers, keypad controllers, and even mice. These things exist, and would be perfect for us who are EMF sensitive. The fact is these things are possible to make, and these companies charge ridiculous prices, just because it's only medical companies that are buying them. Time to start pressuring these companies to make affordable consumer devices? When will a consumer-oriented company wake up to the demand. I'm sure most of us would gladly buy something like this if it was available below $500. but he didn't want to help me much, he didn't have time. but it would be nice to have for gaming. He lists all the parts and how they interact. I have been thinking along the same lines. About 6 months ago I contacted one of these MRI equipment manufacturers, but they were not interested either. They said they get occasional contacts from EMF sensitive people, but they are not interested in selling their $3k-10k products for $500 a piece. The most expensive part is the fiber optic transmitter and receiver. Those are around $15 a piece, and it seems you need 8 of them. In any case the total cost is probably still less than $200. but because i was studying how he made it, i noticed it. But he says it's just a standard mouse, which is misleading. which are likely used to break the light. He talks about it in his video in the first minute. since i notice that the ones i tested are not all build equally. I'm sure someone must be able to build that much cheaper. I have an old Mouse Systems optical mouse and two of the pads that they used. That would be a lot easier to replicate than a modern-style optical mouse because it doesn't require as many optical fibers. (Most new optical mice use a 16x16 pixel sensor, so they would need at least 256 optical fibers and also a light source inside the mouse. I could probably build that. Sailplane would be even better prepared to do it. A mouse requires the cable to be quite flexible, and it also requires a minimum of 4 fibers to handle the motion, plus one for each button, and also a light source. So that's 7 fibers for a 2-button PC mouse with no scroll wheel. I wouldn't count on that to come in under $200 for a one-off project, but if we banded together to buy parts, it might be affordable. Karl just one more idea here is that to reduce the motion requirement it could be built into a trackball mouse instead. That's like a mouse sitting upside down with the ball on the top. Instead of moving the mouse you just move the ball with your fingers. Btw. if anyone here is thinking of starting such a project, and you want some financial support, then make a Patreon page for it. I will chip in for sure for something like this. In addition through Patreon this issue might get a wider audience. Have you used a trackball before ? I remember using it and i didn't like it (but it was long ago). I wouldn't pay for a fiber optic trackball. But using something like Patreon might be a good idea. Yeah it's a good point. But let's say if the option is no mouse ever with fiber optics, or a trackball mouse with fiber optics, I'll take the trackball option. But a traditional mouse is the most preferred option I think in any case. I agree with both of you. I dislike trackballs, but a clean pointing device is probably better than a dirty one. I could buy one of those cables and see how flexible it it. > is probably better than a dirty one. I dunno, I briefly tried a trackball device, and it cause so much hand pain, presumably from the ergonomics of it, that it definitely wasn't worth it. Fortunately, a 1990s Microsoft ball mouse connected to a PS/2 port always works for me. When I tried the rollerball mouse connected to PS/2, I had to get an adapter to plug the PS/2 into the USB. Well that adapter put out some bad stuff - dirty electricity I assume, that really bothered me, so I had to search for a roller ball mouse with a straight USB connection and got a lot of relief from that. But eventually I became sensitized to the roller ball mouse and now I am using a USB trackpad which gave me so much relief for two years, but now I am getting sensitized to it. There must be some kind of electrical issue with my whole computer set up to be causing this. I need a tech. Yes, noise from the computer can make a mouse or keyboard more problematic than they would be if connected to a less-noisy computer. In the past, I've also experienced problems from a PS/2 to USB adapter. But fortunately, both my home PC and work PC currently have PS/2 outputs, so I am currently using PS/2 stuff without any adapters. but also the dirty power that comes from the computer and beyond. This is proven with my mouse study videos. improving these situations is a challenge. As Merializer pointed out, a lot of EMF is transmitted directly from the computer through the USB cable itself. This is a big problem, but there is one cheap(er) solution than a pure fiber optic mouse, and that is a 100% optical USB cable. This type of cable will isolate the mouse completely from the computer, and will eliminate the transmitted EMF. Optical USB cables are still expensive, but it's not as expensive as buying a fiber optic mouse from a medical industry equipment manufacturer. What you then need is a separate linear power supply for the optical USB receiver. This makes the setup more complex, but if constructed carefully, it will reduce some of the EMF. I know at least one person who uses this type of setup, and it's working successfully. You still need to be careful to choose a good mouse, but this type of setup will at least eliminate the transmitted EMF from the computer, which can be part of what is causing your problems. 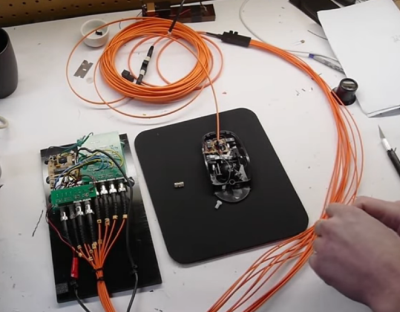 The best solution of course would still be a fully plastic fiber optic mouse, with zero EMF. About 6 months ago I contacted one of these MRI equipment manufacturers, but they were not interested either. They said they get occasional contacts from EMF sensitive people, but they are not interested in selling their $3k-10k products for $500 a piece. If I can come up with something that works well, it would make sense to advertise it to MRI labs because the extra volume would help to keep the price down for all of us. The easiest way to start out is to remove the circuit board from a mechanical mouse and place it far away, so that only the wires for the buttons and motion sensors have to pass close to your hand*. Once I have that working, I can replace those last few wires with optical fibers (while still using the original circuit board). - Is anyone here left-handed? - Does anyone have a strong preference for USB or PS/2? > - Does anyone have a strong preference for USB or PS/2? PS/2 is more tolerable, but it's getting harder & harder to find computers that have that as an output, I think. Although all of my current PCs at home and at work still have them, and I continue to use them with my vintage keyboards & mice.